NEWS FLASH: Take TIME MACHINE to Grand Opening of the Ancient Byzantine City Of ANTIOCHIA – This Sunday, January 11, 2015, from 10 am slt to 10 pm slt. Antiochia is the virtual platform for a number of organisations and individuals whose main aim is to extend the boundaries of information, communication, and education across both virtual and real words. It aims to become a Knowledge Community spanning Real and SecondLife, by focusing on the key values of Education, Citizenship, Creativity, and Diversity. The musical events will cover everything from rock, pop, folk, blues, and country to Spanish guitar and even a much-anticipated classical piano concert that will open our entire day, at 10 am slt. 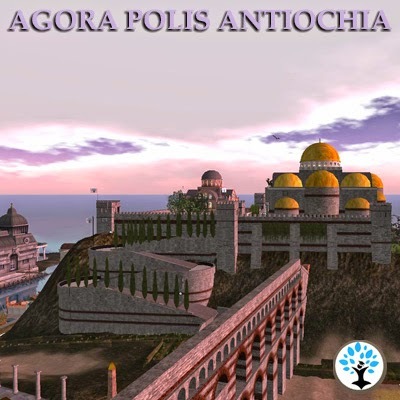 Please feel free to visit the sim and to join our group, Agora Polis Antiochia, so as to stay informed of our future activities and events. You can contact Antiochia’s Project Manager, Alex Olteanu, either in-world by IM-ing his avatar, AlexOlteanu Unplugged, or by e-mail, at alex@antiochiatrust.org; or the Project Administrator, by IM-ing his SL avatar, Brent Ivory.